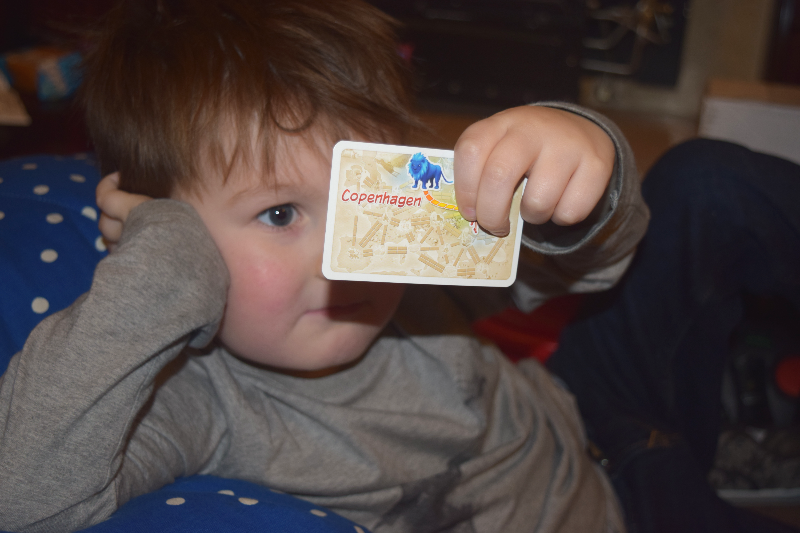 As part of the Blogger Board Game Club we have tried lots of different games we may not have tried otherwise. 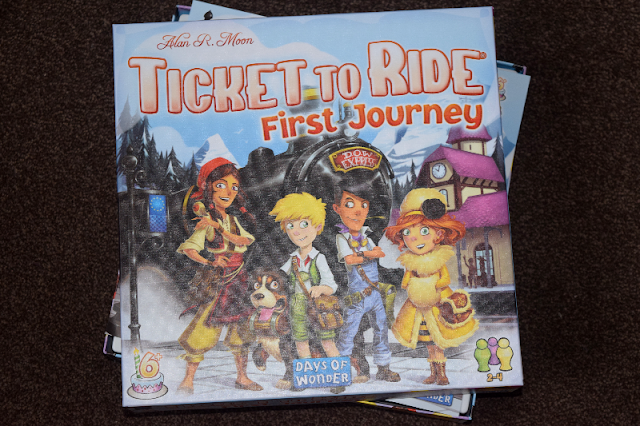 After a few games aimed more at adults, we requested a game for all of the family this time and were sent Ticket To Ride First Journey. 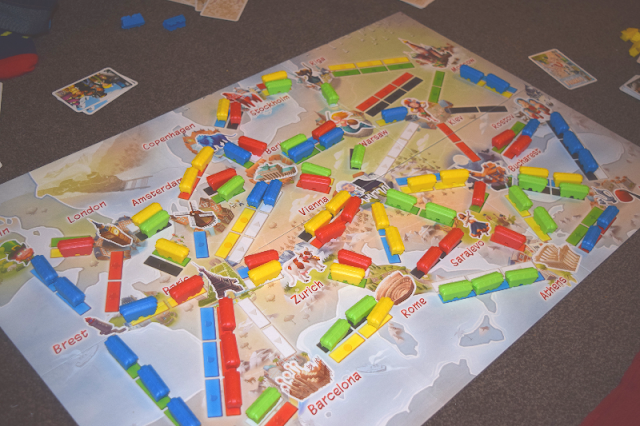 The board is a map of Europe with different coloured tracks all over the board. The game is suitable for 2-4 players and there are four different coloured trains, each player chooses their colour train, is given two journey tickets and a few colour cards. The colour cards correspond with the coloured tracks all over the board so if you have a blue coloured card you would put your train on a blue track and so on. The instructions do sound a little complicated but once you jump in and start playing it is easy to get the hang of. By the end of our first game, Gracie (7) knew exactly what to do and Zach (5) enjoyed playing but needed a lot of support in knowing what to do each turn. The game is aimed at children 6+ as it can get complicated but I think with supervision it can be played with younger children too. It can get frustrating when someone blocks your planned route whilst trying to achieve their own but it was a game that had us all talking and laughing together and I really enjoyed playing it as a family. The first person to win 6 tickets by completing 6 routes is the winner of the game but we carried on to see who would come in second and third place etc. When asking the kids their thoughts on the game, they both said it was great and that they loved playing which was nice as I wasn't sure if they would be frustrated at needing help. I think if we play a few more times together then they will be able to do a lot more for themselves. I am so glad we got to review this game, we will definitely be playing again and again. Oh I love Cluedo but haven’t tried it with my kids yet! I love the sound of this - it's a bit like Monopoly but with trains! And love that it is also teaching a bit of geography too. yes It is quite educational if you think about it. It was just a lot of fun and a bit more difficult than the games we usually play so fun for adults too! I had no idea that there was such thing as a blogger board game club that definitely sounds like my idea of fun!Ticket To Ride First Journey sounds like a great board game for all the family to play and it is great to hear that it is an educational experience as well. I love the board game club it has been so much fun and has given us lots of fun nights in as a family in the name of work! I haven’t tried the original but after playing this one I really want to! It makes a great change to get everyone together for non ipad related activities, doesn't it - and board games are a fun way to do that. Yes definitely. My kids tend to spend most of their time playing alone or colouring/drawing so it is nice to do something fun together. I LOVE the adult version of this so would really like my kids to have this. Looks brilliant. I think I need the adult version. Me and my partner got quite competitive playing against each other with the kids! She would probably love it! This sounds like a really fun game! I love board games and can't wait for my little ones to get a bit older so we can play them all together! It is really nice when they get that bit older and you can enjoy doing things like board games and movie nights etc.